The city of Melbourne, Australia, has extensive forested water catchments. Over the period 1995 to 2006, Melbourne's rainfall, and that in the catchments, has fallen by 75%, most probably as an effect of climate change. The Government still allows logging in some of Melbourne's water catchments, despite scientific evidence that this reduces both the quality and quantity of water obtained from these catchments. In May 2002, the Victorian Government report titled 21st Century Melbourne: a WaterSmart City. Strategy Directions Report identified that ending logging in the catchment would provide an estimated additional average annual 20 gigalitres (20,000 ML) per year. 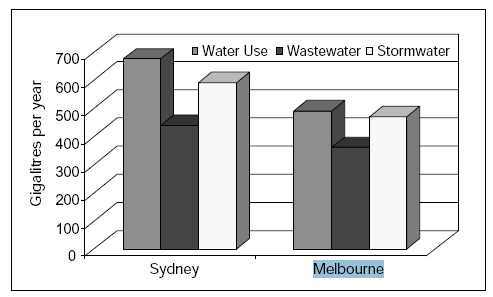 For the week ending Friday May 2, 2008, the average daily water usage in Melbourne was 988 million litres. 9 Who is using water in Australia? Residents of Brisbane and south-east Queensland have been limited to 140 litres per person a day since May 2007. Many residents in Melbourne have fitted or intend to fit domestic water tanks, for which there is a small government subsidy. However, State Water Minister Tim Holding has stated he does not believe that domestic water tanks are an efficient solution for addressing Melbourne's ongoing water shortage. This claim has been questioned by The University of Melbourne systems scientist and microbiologist Peter Coombes, who has challenged the Government's big-project direction, and stated that water tanks can provide significant quanties of water. Professor Coombes confirmed his work showed a tank in each Melbourne household could deliver a city-wide 120 gigalitres a year, more than twice previous estimates by water supplier Melbourne Water. In addition, some residents have been almost entirely self sufficient for water from 2001 to 2008 using domestic tanks in suburbs such as Surrey Hills and Brunswick. 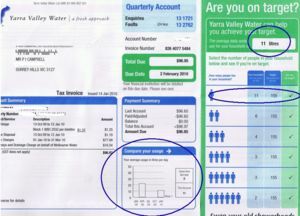 In response to the dwindling water supplies in Melbourne's dams, the Victorian state government introduced voluntary water targets of 155 litres of water per day per person on November 24, 2008. Melbourne's dwindling water storages were reported on April 15 2009 as being on the verge of a historic low, a quarter of a century after the Thomson Dam was promised to drought-proof the city. 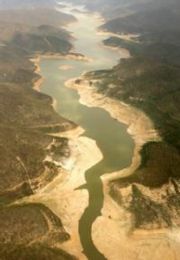 The nine major dams were expected to fall to 28.4 per cent of capacity, matching the record low set in June 2007. Record low rainfall over January and February 2009, when virtually no rain fell, have contributed to this situation. The grim statistics mean Melbourne's dams are holding enough water to supply the city for about 500 days — without further rainfall — given typical water consumption rates. Scientist studying Victoria's crippling drought have proved the link between rising levels of greenhouse gases and the state's dramatic decline in rainfall. A three-year collaboration between the Bureau of Meteorology and CSIRO on the South Eastern Australian Climate Initiative has confirmed that the 13-year drought is not just a natural dry stretch but a shift related to climate change. Their report states that the rain has dropped away because the subtropical ridge - a band of high pressure systems that sits over the country's south - has strengthened over the past 13 years. These dry, high pressure systems have become stronger, bigger and more frequent and this intensification over the past century is closely linked to rising global temperatures, they found. Human influences, such as greenhouse gases, aerosols and ozone depletion, are major contributing factors. "It's reasonable to say that a lot of the current drought of the last 12 to 13 years is due to ongoing global warming," said the bureau's Bertrand Timbal. Who is using water in Australia? Australia's average per capita water consumption is greater than 1.3 million litres per annum. This rate of consumption of water is the third highest in the world. A dramatic increase in water recycling has been recommended for Melbourne, following an 18-month investigation by a Labor-dominated parliamentary committee. As pressure mounts on the State Government to improve its record on water recycling, the report recommended that 100 per cent of Melbourne's treated water be put to productive use. Policy and planning rules were also found to be a major barrier to use of rainwater tanks. Wider use of "water offset" schemes, such as the one that allowed Flemington Racecourse to use extra water because it paid for water savings to be achieved at a third-party business. Promised environmental flows be delivered to rivers such as the Yarra "as a matter of priority". Contracts for the Wonthaggi desalination plant be designed to allow for water production volumes to vary each year, ensuring excess water is not purchased in wet years. The Auditor-General should review the effectiveness of water restrictions. Installation of water-saving devices such as shower heads and dual-flush toilets should be mandatory every time a property is sold or leased. 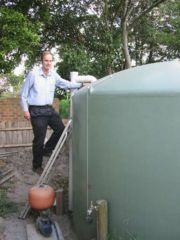 Mandate water tanks for every new household - 5000 litres storage per bedroom - to catch and use rainwater. Subsidise a retrofit scheme for water tanks to existing households, or provide a rebate on water bills for those who have tanks installed. Aim to recycle 80% of the water we use, rather than just flushing it down sewers and out to the ocean. Cease putting water out at the Gunnamatta and other ocean outfalls. Stop logging Melbourne water catchments immediately - this should save 30 gigalitres of water per year. Use recycled water for the cooling towers of Latrobe Valley power stations, rather than drinking water. Design gardens that capture water. A lot of new housing developments have more paved area than garden, which results in more water runoff and less entering the soil and water table. Shift agricultural usage to the most efficient methods. Eliminate sprinkler application and flood irrigation where they are still in use, in favour of drip irrigation.